The top pics shows the green back and a little of the green crown. It also shows nicely the limited black feathering around the sides of the throat which seems more consistent with a immature female. 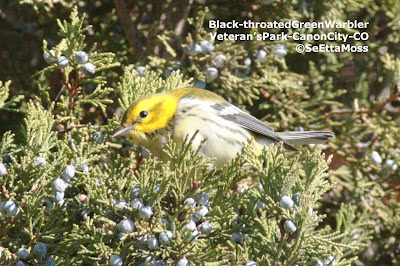 This beautiful 1st winter Black-throated Green Warbler strayed from it's migratory path to stop for a visit in my town of Canon City, CO. I found this sweet thing yesterday morning in a small urban park called Veteran's Park that is located right on H50 on the west side of town. 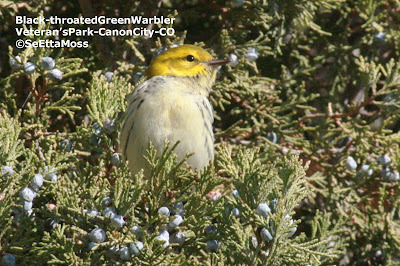 This rare vagrant was at least two hundred miles off course as that is how far Canon City is to Kansas which this species migrates through. This park draws some nice birds to both it's buggy hackberry trees as well as to the long row of conifers where I found this warbler. It was feeding actively in some tall juniper shrubs. Against the dark green of the shrub it's brilliantly bright yellow face looked like a beacon of sunshine that had escaped from the sun. It was calling a lot until it heard the mechanical sounds of my digital camera as I depressed the shutter--in fact, after I took several pics it stopped and looked like it was trying to figure out what that sound was.